Let’s see how the API can be leveraged to decrypt strings, and plug the decrypted strings back into the source code. MainActivity.鷭(x, y, z) is the decryptor method. The parameters indirectly reference a static array of bytes, that contains the encrypted strings for the class. In part 3, we will show how to defeat a complex obfuscation scheme used by many bytecode protectors: reflection. This is the first post of a 3-part blogs series that will demonstrate the new features of JEB’s jeb.api.ast API package. Classes of this package allow read and write access on the Abstract Syntax Trees (AST) of the decompiled Java code produced by JEB. In a nutshell, it allows power users to implement complex deobfuscation schemes or their own optimizations strategies. 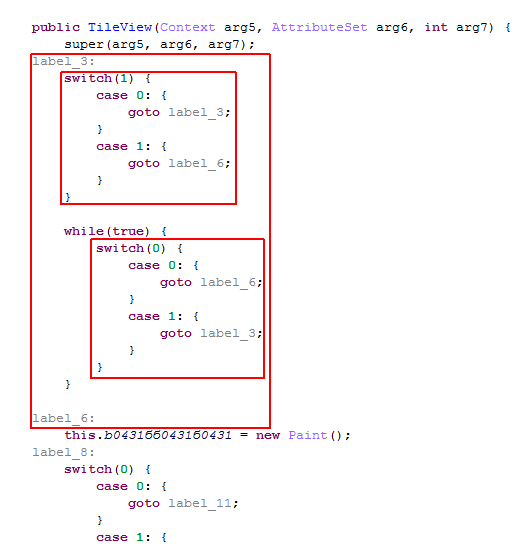 As one can see, dummy switches as well as pseudo-infinite loops have been inserted within the original Java code, in order to produce flow obfuscation. Using the AST API, we’re going to implement a JEB plugin that cleans the obfuscated code. This algorithm fits in a less than a 100-line Python script. Download the script, experiment with it, and get accustomed to the API. In Part Deux, we will show how the AST API can be leveraged to decrypt encrypted strings of a protected piece of code.